The purpose of this Quick Start is to show you how to use the Video Cloud Live module and Telestream Wirecast to create a live event. To learn about all of the features and functionality available in the Live module, see Creating and Managing Live Events using the Live Module. For a series of best practices and recommendations to help ensure a high quality, stable live streaming experience, see Live Module Guidelines and Best Practices. 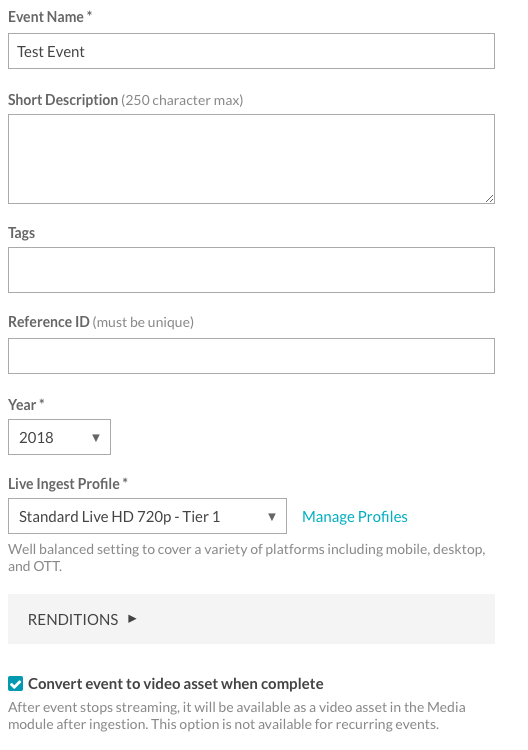 For a list of all the options available from Brightcove for delivering live streaming video, see Delivering Live Streams. Note: For a version of this document that uses the OBS encoder, see Quick Start: Using the Live Module with Open Broadcaster Software (OBS). Note: Live streaming support is available only for Video Cloud Pro and Enterprise publishers. 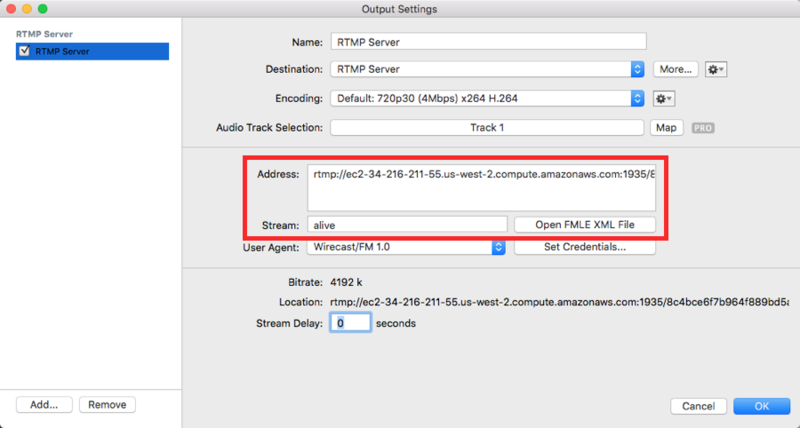 This Quick Start will help you broadcast a live event to different devices using Telestream Wirecast. A free trial is available on the Telestream site. Other encoders can also be used with the Live module. 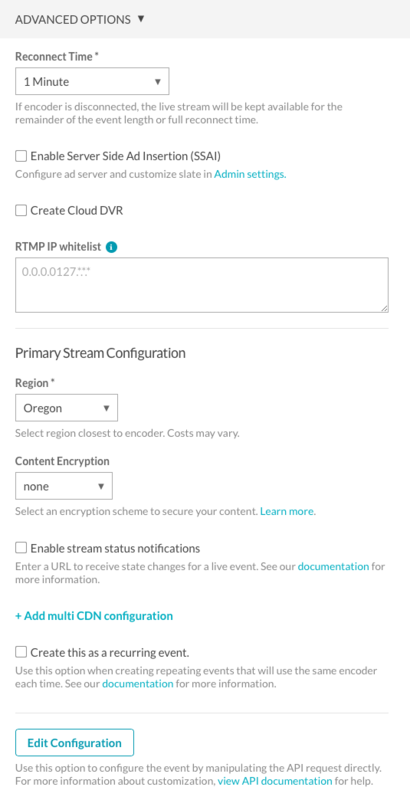 Any Video Cloud publisher who needs to broadcast a live streaming event using the Video Cloud Live module. In a browser window, navigate to Video Cloud Studio. Enter your Video Cloud login credentials and click Sign In. The current Video Cloud account name will appear in the upper right corner of the page. If you have multiple accounts, click the account selector drop down and select the account you would like to save the live asset in. If you select an account that has not been enabled for Live, the Live module will open in trial mode. Click Live in the navigation header. Click the Create Event button to create a new event. Enter some Tags for the event. If your account has been configured with required custom fields, make sure the custom fields are assigned values. 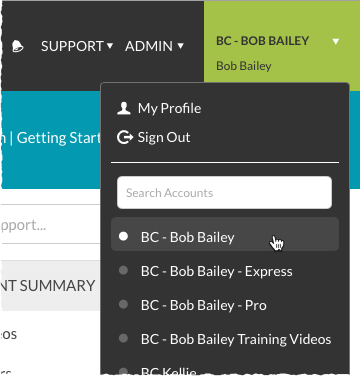 Select a Live Ingest Profile from the dropdown list. The live ingest profile controls the number and quality of live renditions that are created. Select Convert event to video asset when complete. This will save the event as a video in the Media module. Click the ADVANCED OPTIONS link to expand the advanced options. Set the Reconnect Time to 1 minute. Select the Region closest to your location. Click Start Streaming. The Live module will return a Stream Endpoint (RTMP URL) and Stream Name. These values will be used in the encoder settings. In this section, we will configure and use the Telestream Wirecast encoder to support a live streaming event. 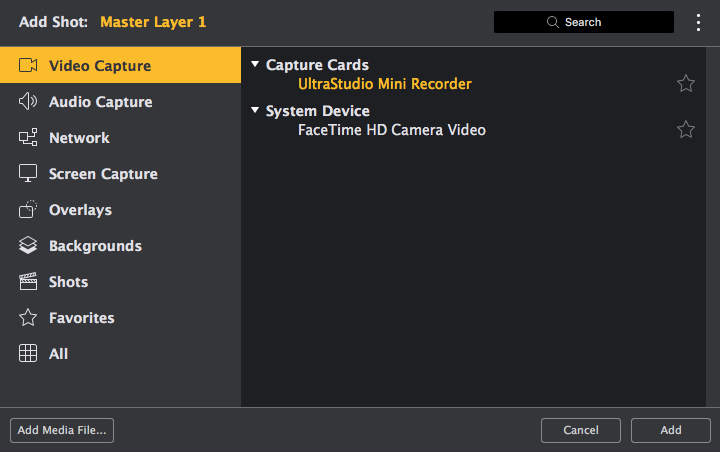 Telestream Wirecast software is a desktop application that captures input from your camera and produces a stream that can be delivered by a CDN. Note that there are hardware and other software based encoding solutions available that may be better suited for delivering your live streaming event. You can download a trial version of the Wirecast software from the Telestream website. 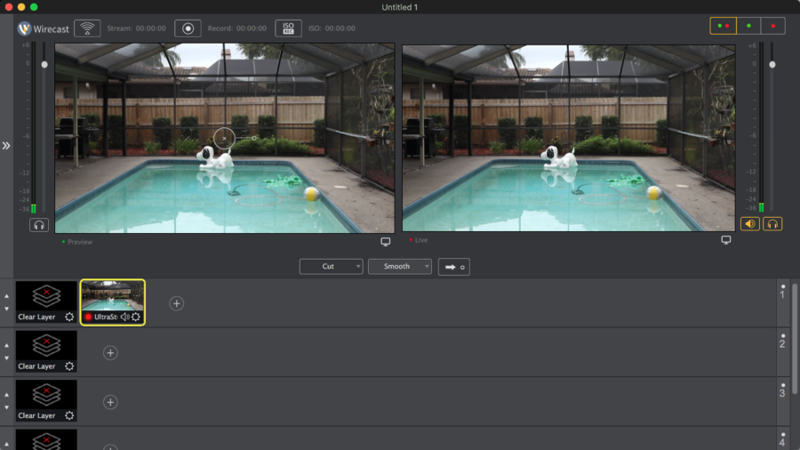 Note: This example uses a DSLR connected to a laptop using the Blackmagic Design UltraStudio Mini Recorder. Note: Wirecast offers the ability to record a local copy of the stream. By choosing to do this, you will have a local copy of the stream that you can create clips from in case any networking issues occur during the broadcast of the event. For information on how to record a local file, see the Wirecast documentation. This example uses a DSLR connected to a laptop using the Blackmagic Design UltraStudio Mini Recorder. Click + and select Video Capture. Select your camera from the list. Click Add. Confirm that the selected video source appears in the preview pane. Click the arrow button ( ) to make the camera shot the live shot. Click the stream button ( ). You will be prompted to enter the Output Settings. Set the Output Destination to RTMP Server. Click OK.
For the Address, use the Stream URL provided by the Live module. For the Stream, use alive. Click the stream button ( ). The live stream should begin. Note: It will take about a minute to process your streams. Return to the Live module. If the Control Room page for the event is not displayed, click the Live tab to display a list of live events. Click on the event name to open the Control Room page. Confirm that you can see the live stream. Note that after starting the encoder, it may take a minute for the live stream to appear. Select a Player and then click the Player URL to view the live stream. When you are done with the live stream, click the Stop Stream button in the Live module. Also, return to Wirecast and click the stream button to stop the encoder from streaming. Note: It is important to make sure you close/stop your encoder when the live stream is complete. 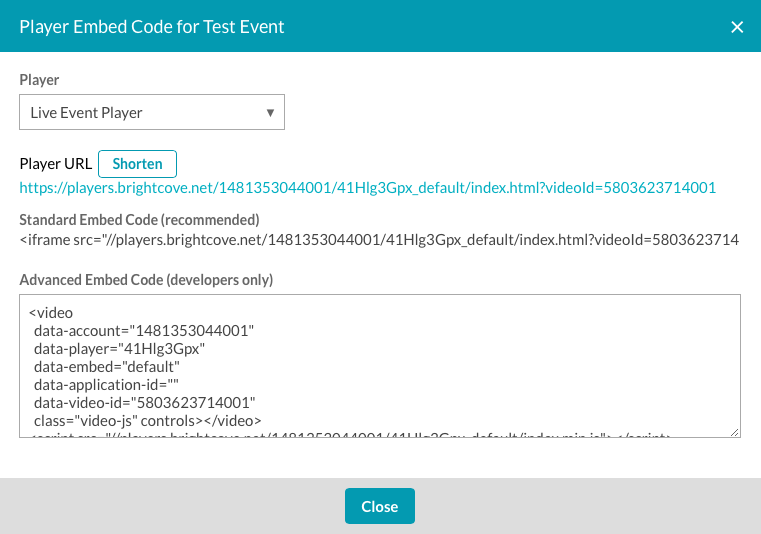 Leaving a connection open between any encoder and Brightcove, even when no data is being sent, may result in unexpected connection charges. Clips can only be created within 24 hours of the event end. Afterwards, the Create Clip button will be disabled. If the event is longer than 24 hours, only the last 24 hours are clippable. Note: For complete details on using the clipping interface, see Creating a Video Clip Using the Live Module. Locate the event and click the event name to open the Control Room. Click Create Clip. The clipping editor will open. Click and drag the clipping handles ( )on the focus timeline to set the start and end points for the clip. Click Preview Clip to preview the clip. The start and end points can be adjusted as needed. Enter a Clip Name and other metadata values. Any required fields for the account will also appear and should be assigned values. Click Create Clip. The ingestion process will begin and the clip will be saved to your Video Cloud account. Clips will appear below the clip editor. Click Publish to Social to publish the clip to one of your social destinations using Brightcove Social. For information on publishing videos using the Social module, see Publishing Videos to Social Media Platforms. 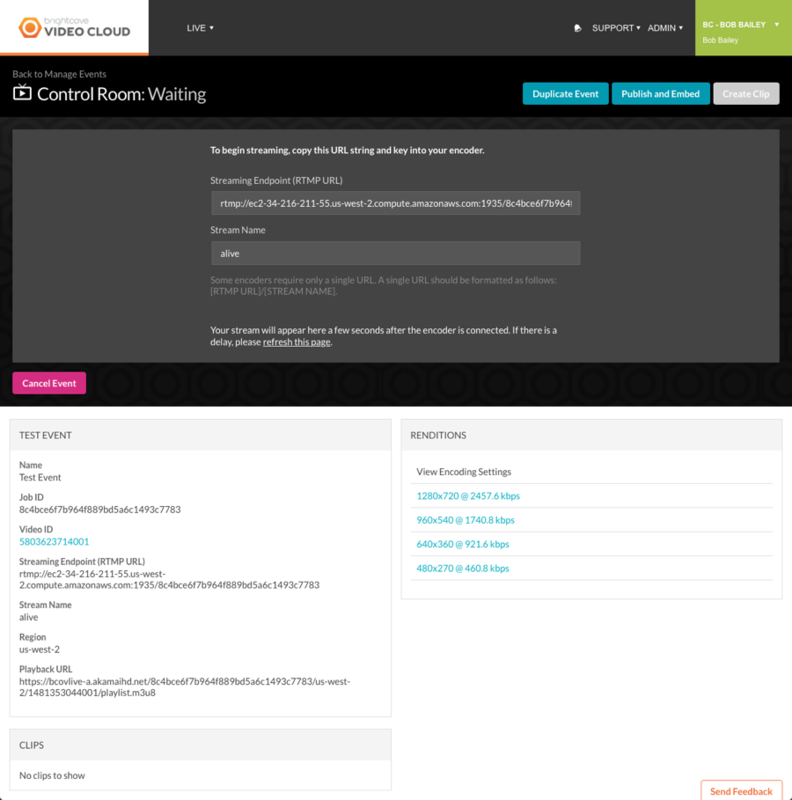 Click the Back to Control Room: Completed breadcrumb. All clips will also appear in the Control Room for the event. Note: You can click the Create Clip button multiple times to create multiple clips of your broadcast. This allows you to trim and save as many times as you want for each broadcast, saving the clips as separate VOD assets in your media library. If you need further help getting your live event to work, you can contact us. To make sure you get the fastest response possible, below is a list of what support will need to solve the problem. The specific symptoms the stream is having. For example, does it not play at all or does it stutter or freeze?